A century of great loss, followed by great regeneration, and hope for the future. The Royal Hospital Chelsea suffered physical damage during the Second War World, with numerous direct hits from enemy bombs during the blitz. Parts of the Royal Hospital Chelsea were also heavily damaged, with some loss of life, during World War I. After being reconstructed in 1923 the buildings were then destroyed by a V2 rocket in 1945. After the bombing of the East Wing in 1940, the wood used to repair it was that left over from the repair of the House of Commons: it's possible to pick this out due to its lighter colour. 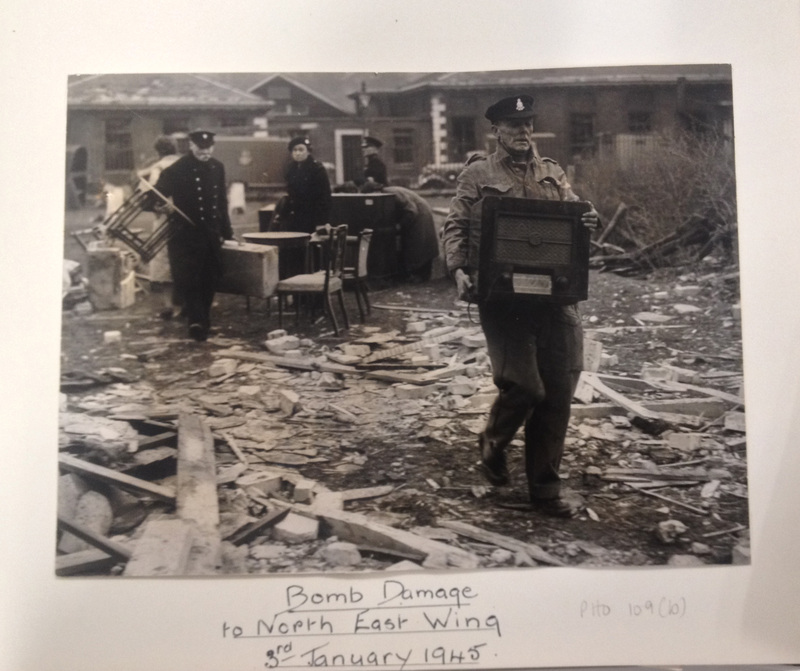 On 16th April 1941 the Infirmary building at the Royal Hospital was hit by an aerial mine which destroyed its East Wing and damaged the rest of the building so much that it eventually had to be demolished. Four nurses, the wardmaster and eight Chelsea Pensioners died in the attack, and 37 others were injured. 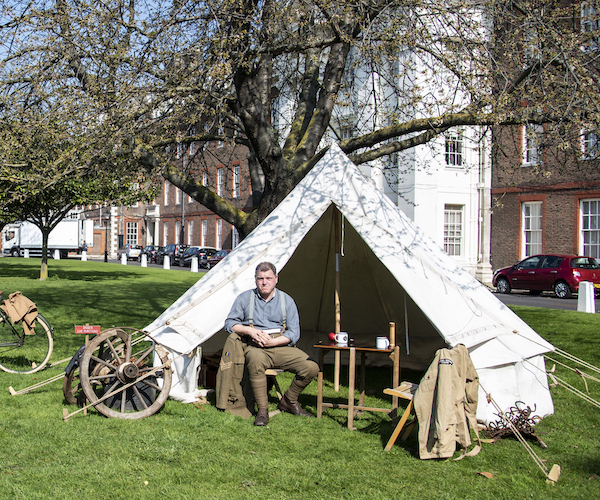 Life during World War Two has been nostalgically recalled as a time when people rallied together in spite of adversity and this was no different at the Royal Hospital Chelsea. 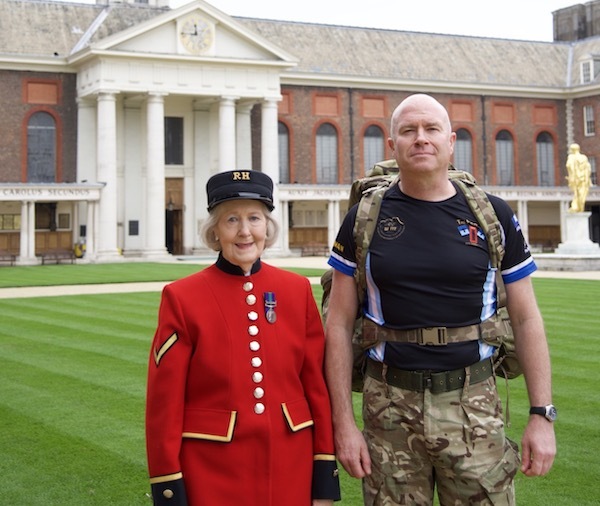 The Chelsea Pensioners and staff made their own contributions, from growing their own vegetables to forming two Home Guard units. Unfortunately though they also witnessed the horrors of the Blitz. 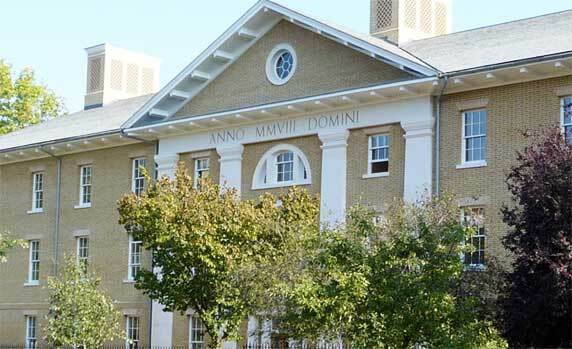 Veterans who thought their combat days were over were once again in the firing line as the Royal Hospital became a target for Hitler’s bombs. Public air raid shelters were built on site, and the Royal Hospital was also used as an air defence location. 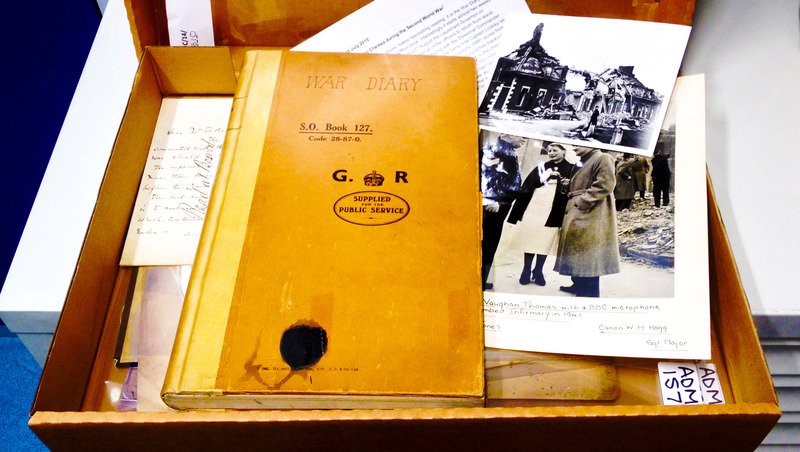 Throughout the war years the Royal Hospital kept a comprehensive diary that documented events on a daily basis. The first blackout was practised as the threat of war loomed over Europe and shelters were dug at different locations around the hospital grounds. A day later was the first gas mask fitting inspection, which reputedly caused some malcontent amongst the Pensioners who were faced with the distressing decision of whether to keep their facial hair! A party of 50 Pensioners were evacuated to Rudhall Manor along with support staff where they remained until 1946. Notable art works were transported to Montacute House in Somerset for safe keeping. 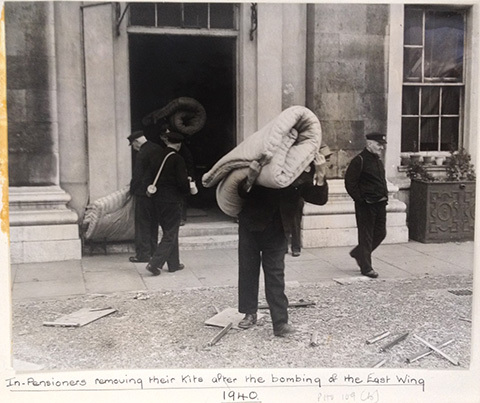 As the war progressed and bombing became more frequent, there were more evacuations to Ascott and Moraston houses. However, most of the Pensioners and staff remained at the Royal Hospital throughout the war. 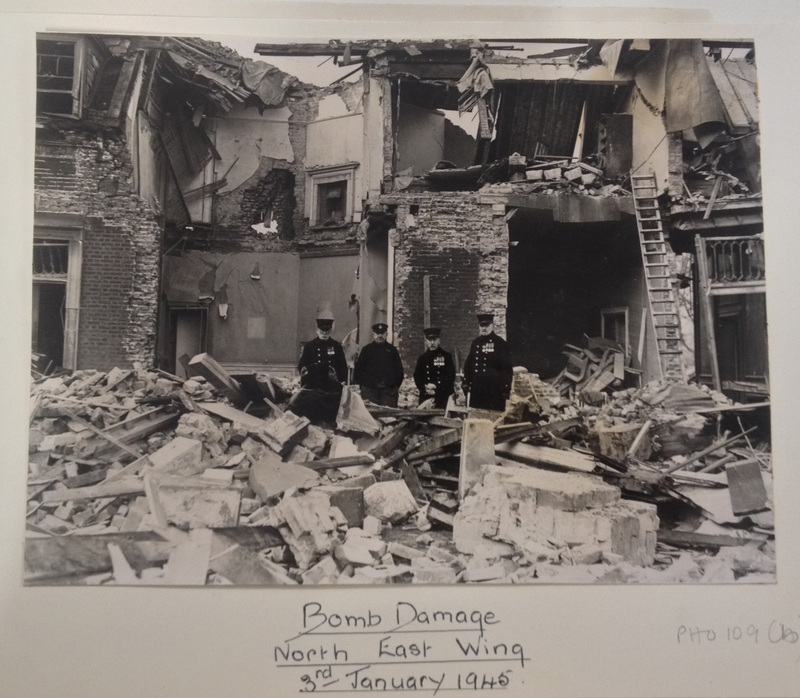 This day saw one of the heaviest air raids of the Second World War and the Soane Infirmary was hit by an aerial mine that exploded and destroyed the East Wing. Tragically, there were heavy casualties; four nurses, the Wardmaster and eight Chelsea Pensioners were killed and 37 others were injured. The North East Wing took a direct hit from a V2 rocket; the wing was completely destroyed and many surrounding buildings were significantly damaged. Five people from the Royal Hospital lost their lives as a result of this attack and 19 others were injured. Pensioners were temporarily accommodated in Sloane Gardens, sent on leave or evacuated. The total fatalities during World War Two at the Royal Hospital was 21, with 33 people wounded. 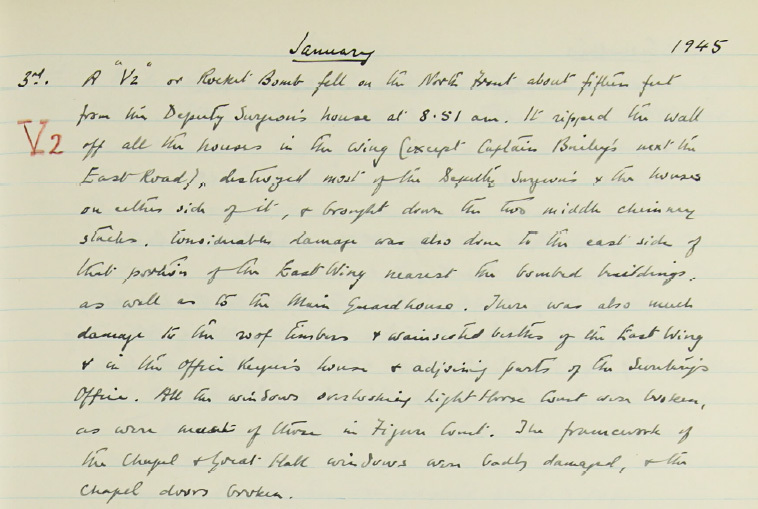 There were 29 bombing incidents and 117 incendiary devices that hit the Royal Hospital.